I would like to obtain assistance / advice with an issue I am having with my LPG converted Lexus GS430. LPG conversion - EGAS multipoint sequential fitted 2011 or thereabouts. Approximately 60k miles on gas so far. The car will run absolutely fine on petrol and literally does not miss a beat. The issues begin when I use LPG. If allowed to automatically switch on, the gas system will activate immediately upon switching on the engine, no matter how cold it is. It will then misfire randomly on pretty much all cylinders until warmed up fully. Once the engine is warm, it will run reasonably well, but does still hesitate / misfire on occasion. The engine reports error codes on bank 2 for running too rich. Once the LPG has been used for a while (as in days), the car will also run terrible on petrol too. However, if the gas system is not used for a few days, the petrol running returns to being great again. My personal thoughts on this are that there is some sort of temperature sensor which is reporting to the ECU / Gas ECU that the engine is hot all the time. This would explain why the system switches to gas immediately when the engine is switched on. It would also explain why the engine misfires when cold because it is being fueled with hot engine parameters. It may also explain why the engine begins to run badly on petrol when used for a few days on gas, because this would give the ECU time to adjust the fuelling based on previous days trends (incorrectly of course). I would be interested in opinions on this, and also, from those with knowledge of gas systems, how many / location of temperature sensors are there typically on a gas system? I am led to believe (without checking myself) that there is a temperature sensor on the vapouriser, which may be causing the issue, however would have no idea if it is possible to obtain a replacement / change this? Is this something that can typically be swapped out or is it a new vapouriser required. Also, if it can be swapped out, are they a standard fitment, or do i need to obtain the exact same sensor. Sorry for all the questions, I appreciate your time reading this! Your diagnosis sounds about spot on. The temperature sensor is indeed mounted on the vaporiser, a small brass plug with two wires coming from it (thin orange ones if I remember correctly). It's a NCT sensor so if disconnected will be saying very cold but if short circuit will say hot, so check the wiring to it for a short first. You could confirm this by unplugging it. With it unplugged it should not try to change over when cold but will if you reconnect it. Gilbertd - many thanks for your quick reply. I will indeed try your advice and report back with more info! It may be worth checking the changeover temp as well - some systems will allow it to be set stupidly low, so the sensor might be ok, but set far too low. It may be in the pipework leading to the vapouriser rather than the vapouriser itself, but shouldn't be difficult to find by tracing the wires from the loom as the only other wires running to the vapouriser will be for the shutoff solenoid. If replacing it you need one of the same type, or at least one thats supported by the lpg system your using. It sounds like you need to calibrate it better than it currently is anyway, so getting hold of a lead to connect to the lpg ecu from a laptop would be a good start, and would give you a definite idea of if the temp sensor is faulty anyway. I've got an eGas system that I removed from my Range Rover SE and the sensor is screwed into the side of the vaporiser on that one with a pair of very thin twisted wires coming out of it. Mine was set with a normal temperature but with a changeover delay of 60 seconds so ran on petrol even when started when hot which was a pain. thats a good idea, I'll get the cable first and foremost. It will come in handy anyway and be worth having. Without looking at it (I'm in work at the moment, of all places on Boxing day), I'm unsure if the temp sensor is removable without depressurising the system. Are these sensors typically within the high pressure part of the vapouriser, ie before vapourisation, or on the other side? It shouldnt matter anyway, I wont remove it unless / until it need replacing, I was just interested. I do know that on my eGas system, its possible to force it to start on lpg by holding the changeover switch down when cranking the engine. Not sure if you know this, but may be of use to you if not. I used to do this when I had turned the engine off for only a few minutes. Switching to gas when cold is one problem, running poorly when warm is another, but they can be related. Can't expect it to run properly on gas from cold start, any codes that the engine ECU stores because of poor running when cold can cause open loop running when it's warm which in turn can cause problems for running properly on LPG. Egas uses reducer temp sensor input for gas temperature mixture compensation, so a shorted reducer temp sensor could cause both problems. It will be in the water circuit if its in a hose, or in a casting or bolt hole if its on the vapouriser. No pressure to worry about though recommended you do it when the engine is cold though. If its in the vapouriser itself (most but not all are) then you shouldn't even lose any coolant. or in a casting or bolt hole if its on the vapouriser. Nah, this is eGas, nothing as accessible as that. As my system has been taken off the car and put in a box, I've just been out to have a look. Although only a crappy phone picture so it doesn't focus on what you want it to focus on, you can see the wires from the temperature sensor. I did recall finding a problem with it when I first got the car and the insulation had fallen off the wires so they had shorted together. A bit of bodgery with tape sorted it, I suspect you have the exact same problem. Alternatively, fit something like this https://tinleytech.co.uk/shop/lpg-parts ... m6-thread/ into a convenient bolt hole or one of these https://tinleytech.co.uk/shop/lpg-parts ... with-plug/ in the coolant hose as near to the inlet on the vaporiser as you can get it. Hard to say but does look that way from your photo. 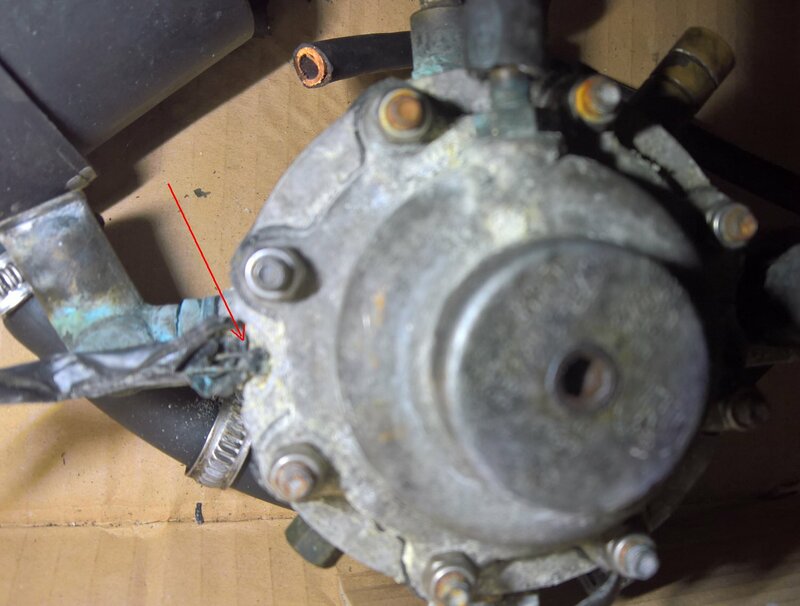 A thought that occurs is that if it didn't always do this (cold switchover), its possible the fault is down to the vapouriser (split diaphram or similar either allowing too high pressure, or leakage via the vacuum connection - easily checked while your in the area if its leaking up the vacuum pipe, just pull it off and see if pressure coming out of it, and likely to happen if its tried to switch while too cold as the diaphram may split if frozen). Firstly thanks for the attention to my post and all the great advice so far. Unfortunately I'm still having misfire issues and other codes. I will get a diagnostic lead and software and report back. In the interim, does anyone have any idea of possibilities as to why I am getting a bank 2 too rich code and a misfire on cylinder 2 (which is on bank 2). I could understand a bit more if it was too rich on both banks. As I said before it runs perfectly on petrol. Clear the codes and run it on petrol for a while, in a mix of different driving, to allow the fuel trims to reset themselves back to normal before going back to gas. As the gas system slaves off the petrol system and is more sensitive to mixture variations, it may just need to reset. To be honest bud, I've been running it on petrol for months. Do you think that now the temp sensor issue has been resolved, it may make a difference if I run it for while longer? As it's been running on gas from cold, the mixture will have been way out. That would cause the petrol ECU to adjust to compensate so the fuelling would be way out once it is up to temperature. However, if you've been running it solely on petrol, it should have sorted itself out by now and the fact that it runs perfectly on petrol would seem to confirm that. If it is still misfiring on the one cylinder, then try swapping the coil pack from cylinder 2 with one of the others. LPG needs a better spark than petrol so if it still misfires but the fault moves that would prove a failing coil pack. What resistance are you reading from the sensor now? Take it you've put the thermistor back in the reducer? If there isn't anything there find the vacuum line from the reducer (if Egas has one - would expect it does) and see if theres signs of leaking gas going into the manifold there, if so the reducer probably wants a rebuild or replacement.